On their most polished album to date, Montreal art-rockers Ought strike a balance between the old and the new. One of the issues most frequently taken with musical criticism and fandom is the idea that, to get a good reception from fans and critics, a band or artist has to play a balancing act. Stay similar enough to the old stuff that they don't alienate fans and do something different enough to make critics say that you're pushing the boundaries. Some bands have leaned too heavily on one end of the see-saw or the other, others have decided not to care and sound different on each album. Montreal art-rock group Ought, however, toes an entirely different line. 2014's Today More Than Any Other Day had the raw energy of home-recorded punk with singer Tim Darcy's voice coming across thin and raspy, more squawking than singing. And 2015's Sun Coming Down reeled back the punkier sounds and stacked layer upon layer of noise over Darcy's exaggerated, almost spoken-word delivery. 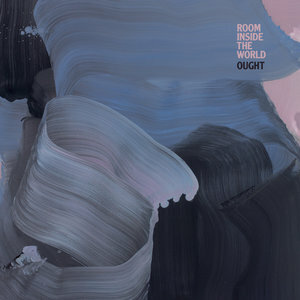 And now, Room Inside the World finds the band drifting again into new wave-y filters, playing with more minimalism, and Darcy carving out another vocal niche to settle into. The shift in tone takes effect immediately on "Into the Sea", which begins quietly with piano chords and the throaty delivery of the line, "I see the stain in the people now." The song develops into a churning, groovy post-punk tune that manages to be recognizable as Ought but is a whole lot smoother in its construction and it stripped down in a lot of ways. The album's lead singles, "These 3 Things" and "Disgraced in America" are similarly tightened up in comparison to the group's earlier material. The instruments are locked into a groove in a way that didn't exist on Today More Than Any Other Day or Sun Coming Down. The group even touches down into the realms of dream pop and shoegaze for a few moments in the latter half of Room Inside the World. More than pushing the boundaries, it would seem that Ought denies that boundaries exist at all. To listen to Room Inside the World in the context of the group's discography (not to mention Tim Darcy's straight-forward, approachable solo album of 2017) it's almost as if one is listening not to the same band doing different things, but entirely different bands altogether. Ought's ability to fully inhabit and execute the sound they are aiming for on any given album is notable, of course, and it doesn't necessarily mean that there aren't hints of how each sonic style affects the others. "Disaffectation" and "Take Everything" are prime examples of the band translating their fascination with harmonic tension into the context of a cleaner sound. In fact, in contrast to the more polished sound overall, the moments of suspension and intensity take on new meaning and impact. The group's songwriting and sense of structure are in fine form as they always have been. Each Ought album has an intentional and effective construction, and the pattern continues here. Of course, it's hard to discuss Ought without mentioning the noteworthy vocal stylings of Tim Darcy. In the past he's been equal parts Richard Hell, Frank Black, and street preacher, but as the band has evolved more and more voices have found their way into his. David Byrne and Frank Zappa and Jello Biafra on Sun Coming Down. And with Room Inside the World there are hints of Morrissey and Bryan Ferry and, at moments, Built to Spill's Doug Martsch. The flexibility of his singing gives a number of the album's tracks renewed life and allows the rest of the instrumentation to be flexible as well. On "Desire" in particular, Darcy flips between his nasal tone and more '80s new wave-inspired throaty shout which suspends and releases the tension within the rest of the song. The continuous motion and evolution of his voice along with the slow buildup of the background vocals and the instrumental adds momentum and vitality to the track in a way that just wouldn't work with a lot of other vocal styles. Ought is a band full of musical chameleons. It would seem that they can fit into and fully embody any musical puzzle you hand them and you'd still know that it's them. Have they discovered the solution to the critic/fan pleasure balance? Maybe the solution is just making great music that evolves on its own and builds on where it started from. Some might say that Room Inside the World is too far removed from the manic proto-punk stylings of Today More Than Any Other Day or the barrage of organized noise that was Sun Coming Down, but this reviewer is of the opinion that those were building blocks that still exist in the final structure of this new album. It's just that the ways in which they support this new structure might not be what anyone expected, but the unexpected, in this case, is a pretty damn good surprise.